How many musicians are there in the United States? It’s a question we couldn’t help asking ourselves when we first met artist Johnson Slinger*. He’s an imposing self-taught guitar player. His voice bears a remarkable grunt, not unlike Tom Waits or Bob Dylan, but that won’t hold him back. He performs his authentic tunes, just the way they come to him. Commercial success doesn’t seem to interest him at all, as he’s also a devoted stay-at-home dad. Some estimate there might be no less than 900.000 musicians just like him in the US alone. I am an artist, musician and father. You might call me a product of the nineties when there seemed to be nothing better to do than to embrace capitalism. You know, after the fall of the Berlin wall, at the time of the first dot.com bubble. I was one of them angry young men, ready to take on the world. Until I couldn’t take it no more. That’s when I decided to reinvent myself as a human being. With a bigger heart than his wallet. Is this when you became a musician? Yes! Just after the birth of my son. A beautiful little piece of humanity, with too much energy to spare. Literally. He hardly slept at night, much too busy to calm down at a regular time. I found myself singing these ancient nursery rhymes by his crib, calming him down, guiding him to sleep. It was a powerful, guttural feeling of belonging. With my voice, I could soothe him and get him to surrender. With my little ukelele, I accompanied myself, but soon I wanted more. So I started collecting these songs online, on my personal startpage, learning their lyrics all over again. It became quite a collection. And that’s when it hit me: this is what I really wanted to do. A lot of musicians use an iPad on a stand in place of traditional sheetmusic on paper. So now you use start.me all the time? Definitely! For a self-taught musician, there’s really no better online tool. 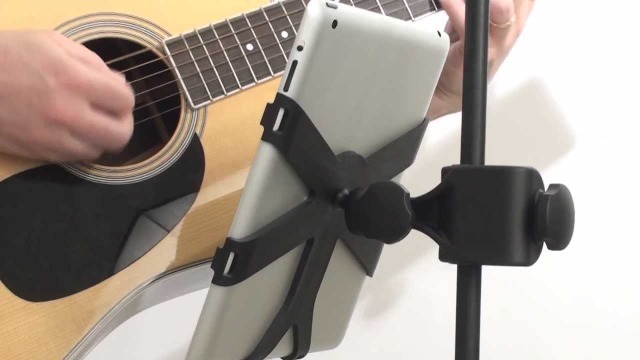 Especially on my iPad with Music Stand, it’s a miracle cure for any musician. 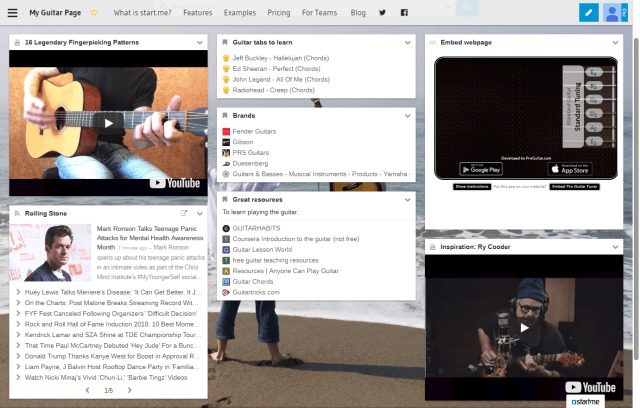 I don’t just bookmark any song or guitar tab, I also watch and learn from my favorite YouTube Teachers. It’s no longer necessary to carry this bulging folder along, I just open my browser, and there it is. Everything in one place, a place for everything. I even get to install and use a metronome and a tuner. I can start programs to record my training efforts and play it back to me. Deliberate practice, I believe that’s called. It’s liberating. Do you share your links with fellow musicians? Well, that’s supposed to be a cinch. And it is, definitely. It couldn’t be easier to share everything I’ve found and learned with other performers, but usually, they’re too squeamish to switch from analog to digital. Many still prefer the faded pieces of paper in their binder, which really doesn’t seem handy at all. Not to mention, that it burns trees! So that’s why I really wanted to tell my story on your site. I hope there’s someone out there who’s willing to give my Guitar page a try and see what it’s all about. I mean: rock and roll don’t have to be rock-old and stone-cold. It could be modern and beautiful too. It might even make you a better, more versatile artist. More communicative and responsive also. But hey, that’s just my opinion. Well, as I am still a devoted father, I’m choosing not to perform for the moment. I’ve been writing my own material, again with the help of your tool. I’ve made a new page, not to be shared this time, with all the inspiration and sound effects I need. I’m totally immersed in this creative process that’s thrilling by and in itself. Just like the music, this journey is its own reward.